Days of sea and sun is what we really fancy during these summer days. But for those seeking other temptations, there are villages in Malaga’s lost geography that awaken our travelling inspiration. One suggestion: Head down to the coast one day and visit one of the most beautiful villages in Malaga: Frigiliana. It is accessed from Nerja where you’ll find a small turnoff towards the mountains. Feel its village spirit and its Moorish past. Narrow cobbled streets, labyrinths and passageways that end up overlooking an immense valley where the village sits, that over the past years it has received numerous visits of tourists that spend their vacations on the coast and want to experience a completely different day out. The walking traveller will discover many surprises in many corners and details with every step, from the calle Real (the Royal street) till the famous ‘Barribarto’. And the light, so much light, is what its impeccable whitewashed facades reflect. The tourism coexists with the municipality’s traditional economy, based on the agriculture, which allows it to have wine cellars, olive oil mills and a unique factory that makes a delicious traditional sugarcane honey (molasses). There are two towns in Frigiliana: the old quarter and the modern town. The Manrique de Lara Palace was built with the ashlars of the old fortress and its interior holds the only sugarcane honey (molasses) factory in Europe, which is why this building is known as ‘El Ingenio’. It was the palace of the Dukes of Fernan Nuñez, owners of the villa since 1640. The San Antonio church was built on an old mosque in 1676, that houses three naves separated by middle point arches and a choir with a banister as an example of baroque-style decoration. Its surroundings have sites and tombstones that show the early presence of mankind. In the Cave of the Bats, in one of them, there are stratums from the Neolithic period to the Bronze Age. 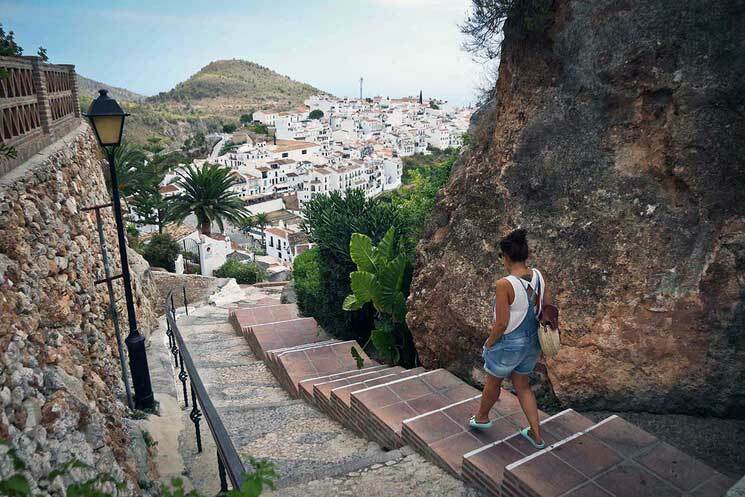 Frigiliana exists as if it were the mountain conscious of its neighbour, the hectic maritime town of Nerja.